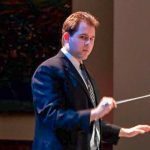 Assistant Conductor John Hylkema, is in his fifth season with the Raritan Valley Symphonic Band however, he’s no stranger to the podium. John currently serves as the Director of Bands at Readington Middle School in Whitehouse Station, NJ, where he was named the New Jersey Governor’s Educator of the Year in 2018. His duties include directing the 3 concert bands, jazz ensemble, pit orchestra, pep band, and is the district’s brass lesson specialist. He also is also the Assistant Director for the Hunterdon Central Regional High School Marching Red Devils. As an active musician, John plays trumpet for the RVSB, the Eastern Wind Symphony, freelances as a pit orchestra musician and continues to attend various conduction symposia around the country. John holds a Bachelor degree in Music Education and a Master degrees in Wind Conducting and Music Education, all from Syracuse University. While at the Setnor School of Music, he gained extensive experience as a music director and conductor at the University and around the Syracuse community. John can be heard on many recordings with the Syracuse University Wind Ensemble, produced by Mark Records, and has performed with world-renowned artists. His professional organizations include the National Association for Music Education, New Jersey Music Educators Association, New Jersey Association of Jazz Education, Pi Kappa Lambda and Phi Mu Alpha Sinfonia.